Chapter 2: "The Shackled Hut"
The winter portal has closed, but the heroes now find themselves trapped in the frozen land of Irrisen with an urgent quest—to find Baba Yaga! In order to track down the missing Queen of Witches, the heroes must brave the monster-infested capital city of Whitethrone, where Baba Yaga’s Dancing Hut has been captured and put on display. Will possession of the miraculous artifact lead them to the Witch Queen, or will they die a cold death at the hands of Irrisen’s White Witches? 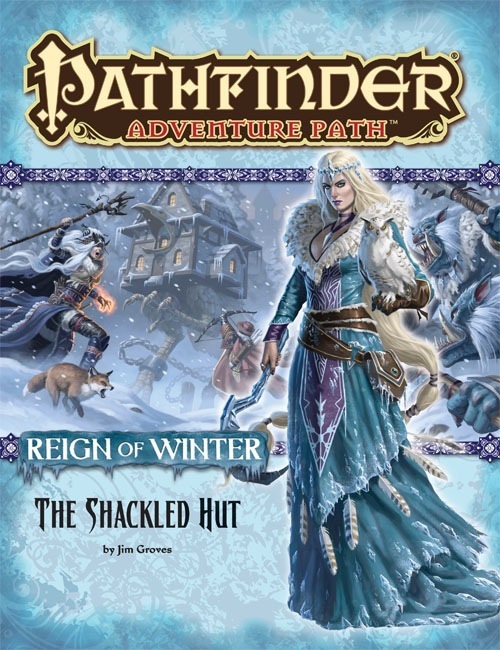 “The Shackled Hut,” a Pathfinder RPG adventure for 4th-level characters, by Jim Groves. An exploration of the ecology and the origins of the cunning and dangerous winter wolf, by Russ Taylor. A look into the cult of rebels and revolutionaries who revere Milani the Everbloom, by Sean K Reynolds. A dangerous introduction to Whitethrone’s aristocracy in the Pathfinder’s Journal, by Kevin Andrew Murphy. Four new monsters, by Jim Groves, Dale C. McCoy, Jr., and Sean K Reynolds. 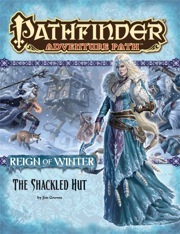 The Shackled Hut is sanctioned for use in Pathfinder Society Organized Play. The rules for running this Adventure Path and Chronicle sheet are available as a free download (639 KB zip/PDF). I'll be honest that after playing this chapter I was not all that impressed. The story was good but it was the usual AP elements that disappointed me. For a mostly urban adventure we found that the setting stopped us being able to buy and sell so we felt woefully unprepared. APs don't seem to want you being up to party wealth levels. But the story was good and we all enjoyed that element a lot. An adventure by Jim Groves ... groovy. Ahem! Having ran my group of five through this adventure, here's some quick pros and cons. - the tower, everything, the encounters, the theme, the NPCs, big freaking <REDACTED> fight! - magic items, especially the ones introduced in the adventure. - the <REDACTED>. Apart from <REDACTED>, the team found it a bit jarring to have a more-or-less railroady string of feels-like-random encounters IN a city. Cities are about going wherever you want however you want, they said. - the <REDACTED> part with the <REDACTED> - that was a bit of "do X, Y and Z to open the red door" videogamey. Overall, the level of fun and enjoyment at the table was great and we're looking forward to more of your adventures. I'd rate this 4,5 stars, but since you should be nice if you can be nice, this one gets 5 stars from me. I'm sure I'll enjoy further adventures from Jim! The majority of the supplemental material was outstanding. The articles on Milani and Winter Wolves were useful and interesting. Most of the monsters in the bestiary were interesting. However, the Mirror Man was one of the most creative and creepy offerings I have seen in an AP in a long time. Kudos to the designer and artist. Unfortunately, the fiction in this AP did not keep my interest. I understand that the authors of this adventure and the prior one communicated and collaborated a great deal, and I think it is evident in the smooth transition between chapters, and the uniform handling of NPC's. The adventure is filled with many fascinating encounters and adversaries: including the woodsman's wife, the gate guard, the goblin alchemist, the entirety of the Clocktower, and the pipers. However, there were some things about the "storyboarding" of the adventure which seemed weak when my group played it. There is an extended journey at the beginning, and while some of the encounters are excellent, there are perhaps too many. Similarly, there is a huge number of encounters just inside the city gate. On the other hand, there is very little general information on the city as a whole. And as a specific example, the overgrown Merchant's Quarter lies directly between the gate and the safehouse, but there is no GM advice on how to handle the passage. While I know that there are many details on the city available in other products, I feel one or two encounters could have been cut to provide more information, or perhaps some encounters not tied to the gate, clocktower, or forest. My players complained that Whitethrone provides the first opportunity in the AP for them to seriously upgrade their equipment, and the first encounter they have after that opportunity is with a foe that destroys weapons. Are the reviewers actually playing this or just reading ? So, I wanted to write this review because I've read some well worded and, well frankly nitpicky reviews about this adventure path. It really started to strike out at me that many people are reviewing this adventure without using the kind of language that would lead me to believe they actually played it. I have GM'd the first 2 parts of RoW and this adventure was amazing. It was probably up there with some of the best games I've played. I had a lot of resources for this game, including the white dragon evolution set, all the paths of prestige materials, irrisen land of winter, all the maps, land of the linnorm kings, people of the north, the cards, all of it. And it paid off in spades. I actually found this quite a flexible game to GM. I'm a ruthless GM, and I have 20 years of experience being ruthless. And my players are pretty damn good at getting by that as well, as the best players are. Instead of being a letdown, I found that by the time the clocktower part of the game had been reached, just for narrative flow it was time to start playing fast and loose with the source material. It's more important that the story you are telling with the PCs is heroic, fluid and balanced. I just let it naturally evolve, and if the PCs want to cut to the chase and get the hut after Logrivich, no problem. It's about making a great experience, not necessarily being "railroaded by the book" as some have complained. If something is anticlimactic, don't do it ! You have to be completely familiar with the source in order to be comfortable doing this. No reading with the players as you play! You, the DM, should be using this story to great effect, and if it needs a little nip and tuck here and there, then so be it. For example, Greta almost immediately became part of the group. My group is small, and I allow the players to play up to 2 characters at a time, which is great because, not only does it solve balance problems with the power of the party, but as a bonus if somebody dies, the player is not sulking in the corner of the room all the rest of the game. They have at least a second chance. And it also gives the players a chance to play some of these great NPCs in this adventure. So, Greta was snatched up and became a memorable PC right away. Even I let them play Nadya Petska at points during the game. The story we created thanks to this amazing source material was really memorable. I've read all the books in the series and I think 3 and 4 I might need to take a heavier hand to... but I don't know until I play with the party. I'm sure as hell going to let them roll fluidly through it, and if stuff isn't working or if the party is tired of combat, I make tactical decisions. It really makes for a better game. Anyway I wanted to put this out there since I was reading so many very technical reviews that didn't seem to reflect how the adventure actually plays. They might be technically right if you're at game con arguing with Monte Cook on the merits of game design, but it's not about that for me, it's more about the fun everyone has, and how the "movie in the mind" is playing out. Bottom Line - Highly recommended. A big round of applause and huge congratulations to Jim Groves for nailing down a spot on an AP lineup. And not just any AP but the Irrisen AP. Well done Jim. Having read Winter Witch, I'll be very interested to see how you tackle the city of Whitethrone. Especially with all the Winter Wolves and Ice Trolls walking around. That should be a terrifying experience considering the party will only be APL 4. Looking forward to it. Edit: And if you weren't proud enough about getting this adventure as it is, Jim, yours will be the very first adventure to have the infamous Dancing Hut. Talk about legacy. Big shoes, buddy, big shoes. Nice image of Feiya on the cover. Thank you, Block Knight. It was a dream come true, and an awesome responsibility. I hope I have lived up to the challenge. AP's are a big responsibility, but I really enjoyed writing this. Every writer has their own style, and my hope was to provide a lot of cool roleplaying situations and deliver a challenging and interesting adventure in all other respects as well. I hope people enjoy it, and now that it is announced I'm going to simmer down, hush up, and let the developers do their craft and polish it. My hope is that the final product does the AP line proud. Big time Kudos Jim!!! Well-deserved. It'll be fine. Paizo's developers and editors will always crank it up an extra notch and your own passion for Irrisen is sure to come through. With your stellar start it's sure to be awesome! Better be careful that Shackle doesn't become the new Carrion. I'm sorry? I'm not sure I understand. Well everyone remember to bring your skis. Nice to team up with you for this one, Jim. Irrisen is great fun to write. Likewise! I'm looking forward to your story! Yes, I adore Irrisen. It's my all time favorite of the evil countries. I'm looking forward to the winter wolf article too. I know who wrote it, but don't feel it's my place to say.. but I'm pretty excited about it. Carrion was just a word that has come up a couple of times in AP titles. Since Skull & Shackles and Shackled City (a while back for sure) Shackles is a particular word choice that might not be best to use in titles for a while. My thoughts exactly when I read the title,Dudemeister. Bar the title, I am really excited about this one. The hut of a extra-multi-dimensional power (and an artefact itself) gets trapped? Hm. Does the PF journal include one of your famous poems, Kevin? Grats, Jim for writing this! ecology of the winter wolf!!!!! I LOVE YOU PAIZO! Finally we will get a picture of the Winter Wolf in paizo stylooo!!!! This is awesome, looking forward to seeing it. Love that picture of the ice troll! The mockup artist really likes Feiya don't s/he? I tend to put lots of notes on monsters and ecological details into the text of my stories anyway, so hopefully you'll enjoy it too. Though I'll admit I'm also looking forward to reading the ecology of the winter wolf. They just use existing art either from current books or ones coming out soon for the place holder art. Add me to the list of people that isn't entirely excited about the word "shackled". This sounds fantastic though, I've seen people championing Groves on these boards. Can't wait to read (or run) it. Right... anyone know if Sean will accept bribes to let me pick two or three things from my Wayfinder writings to make it into canon? I love the AP's title, and the imagery it invokes. "They captured Baba Yaga's Hut ? THE Baba Yaga ? But how dare they ? And why is the old crone letting them do it ? What's happened to the ultimate witch ?" This AP is making me giddy. Hope the winter wolves are pleasing to the mind's eye! They are :-) ! And I find the Ice Troll on the AP's mock-up cover strangely cute ! I have been hexed by the Winter Witches, no doubt ! Sorry if I get it wrong, i'm not familiar with the english term Mind's eye, it sounds to me like its your fantasy or you have to create a picture with your mind. No, no, Russ was just saying that he hopes you enjoy the article. Which is something of a hint about who wrote it. Its just an expression. "Mind's eye" sort of means "one's imagination", or "the inner eye of your imagination". That he hopes it gets you excited and helps you devise all sorts of cool adventures and ideas related to winter wolves. Congrats Jim! Can't wait to see how this one turns out! And What is that icy owl creature in your avatar? Is that a creature still to come or is it in a product already? It is an "erudite owl" and actually I've been using this avatar since 2007. (Though I tried a couple others out, but I always came back to this one). I'm not sure where the illustration came from, a piece of artwork from the Dragon magazine days. My board name used to be "Watcher", but once I started freelancing I asked Paizo to change my primary account to my real name. That way people can recognize me from the products I've worked on. So, the erudite owl won't be making an appearance in the adventure. Sorry! But, now that you mention it—I guess this is the best possible avatar I could have. Icy Owl FTW! Yay, Jim! SO looking forward to this!!!!! Thank you Christina, I was just going to congratulate you on working on the Champions of Purity Companion book! Yeah, mind's eye because hopefully the article will get you thinking. I'm sure the art's going to be amazing for it, but I won't have had anything to do with that. Looking forward to new art as well - although I do like the old version very much. Hopefully it will get made into a paper mini! RuyanVe, what old art are you talking about? I've never seen Winter Wolf art in a paizo product, in the bestiary there is a picture of the lesser worg, not the winter wolf? Nono, I meant the art from D&D3.x as can be seen here. oo, i really disliked that art, liked the D&D 4th edition winter wolf art much more. Seriously Jim, BIG congratulations! Couldn't have happened to a nicer guy. Let me add to the many kudos you are getting! Since the days that you went by "Watcher", I knew you had that "Special Something" for writing awesome stuff (heck you helped me when I was stumped in my home brew designing on a few occassions and I thank you for that!). So, I know that your work with this AP will be beyond awesome! What race is the archer on the cover? It's a frost troll - but the cover is a mockup and will change. Wait a minute! Am I reading this coreectly? We're actually seeing the INSIDE of the Hut? Can anyone confirm this without causing spoilers? Considering that the insides of the hut are described in Artifacts and Legends, and locations one can travel to using the hut include Distant Worlds, I am safely betting that this is gonna be the HUT-HOPPIN' AP and I can't describe how happy that makes me! ...A&L tells us that the Hut's interior mutates to itself according to different worlds. Also, a copuple of rooms are mapped out. However, I was talking aboput the Hut's interior as it relates to this AP and if its going to detail in THIS particualr chapter of the AP. I agree. World hopping would be cool! I'm sorry.. I'd like to, but that really is Rob McCreary's purview. I flirt with hints sometimes, but this is a very big deal and his baby too. Its gonna be great though, I promise you that.